UV lights for fun. UV lights for security. 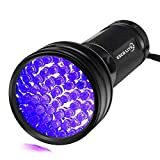 UV lights for intense cleaning. As the world evolves, people unlock the essence of incorporating UV lights on day-to-day tasks. Since UV lights become more remarkable, there’s a need to produce the best UV flashlight. Thanks to those competing manufacturers. Your job may get more productive or your night party may get more exciting – all at a cheaper yet efficient UV lights on the go! 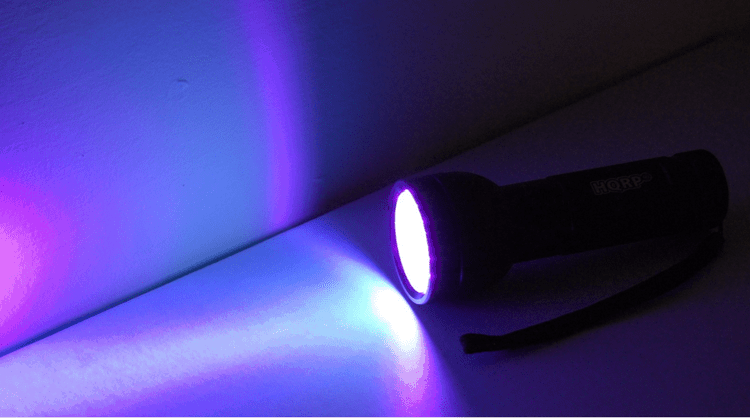 What is a UV Flashlight? UV Flashlight, also known as black light, emits ultraviolet light which is not visible to human eye. Our human eye can only perceive the colors red, orange, yellow, green, blue, and violet. Ultraviolet is classified beyond violet. You may wonder why the source emits violet light. It is designed on a purpose for you to know if the flashlight is operating or not. Overexposure to ultraviolet light is risky for your eyes and your skin. While you see a little visible violet light, ultraviolet light is emitted throughout your surrounding without you knowing it. As a precautionary measure, you must not point the UV flashlight directly to your eyes. Do not shine it towards others eyes as well. Like a normal visible light, UV light can damage your eyes! When you turn on the UV flashlight, white clothes, your teeth, and other items will glow in the dark. You may even see invisible stamps, invisible stains, and hidden security measures on a paper bill or identification cards. There are factors why such stufffluoresces under the presence of UV light. The majority of the glow in the dark items contain natural or synthetic phosphor. Phosphor reacts to radiation, one of it is the ultraviolet light. Upon reaction, the phosphor emits a visible light. Teeth, fingernails, and laundry detergents contain phosphor. Your teeth, fingernails and newly washed shirt will naturally glow under UV light. Some items may not contain phosphor. But it may contain materials with natural fluorescing capability. For instance, security threads from paper bills and the exoskeleton of scorpions naturally fluoresce in the presence of ultraviolet light. Partygoers like to use fluorescent items for fun especially in clubs and bars. Detectives use UV flashlights to aid them in finding evidence. 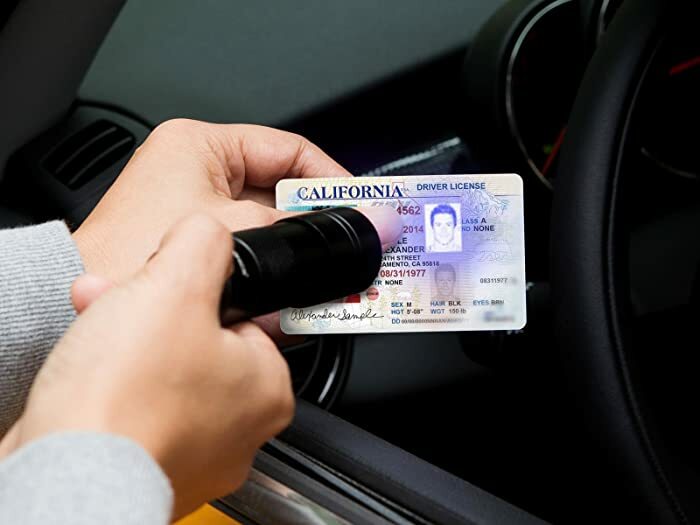 The government incorporates fluorescent items on bills and IDs for security measures. Others may not appreciate its usability, but you know its big significance to our world. Here is a range of activities where people integrates the use of UV flashlights. The market is flooded with different UV flashlights at varying costs, quality, usability, efficiency, and design. Here, we review the top 5 UV flashlights which cater your varying needs. As you read this section, you must judge if the UV flashlight matches your preference. Are you on a tight budget? Don’t worry! With this affordable UV flashlight, you will never skip the fun on perceiving fluorescence! 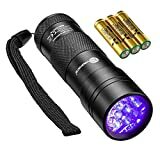 TaoTronics TT-FL001 is the cheapest among the best UV flashlights in the market. Cheap doesn’t always mean poor quality. This UV flashlight still brings out the usability on fluorescing hidden items. Included in the kit are 3 Duracell AAA batteries on your purchase. These batteries are sufficient to power up the 12 LED lights on an estimated 5-hour continuous usage. The only downside of using money-wise products is its efficiency. While using this UV flashlight, I can only perceive a small beam radius. Yes, it can help me see items fluoresce near me. But the fluorescence is not really intense. It is also better to perceive items from afar. 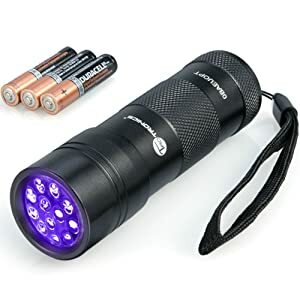 This UV flashlight will surely do its job. Regardless of the price, you will be satisfied especially on stationary use. But if you like walking around to hunt hidden items, it will be an enjoyable mission for you. KMD Home loves to merchandise products for home efficiency and productivity. As a homeowner, you surely want to live in a safe, clean, and odor-free home. This is where KMD Home gets their motivation while carefully producing its Ultra Bright UV Flashlight. 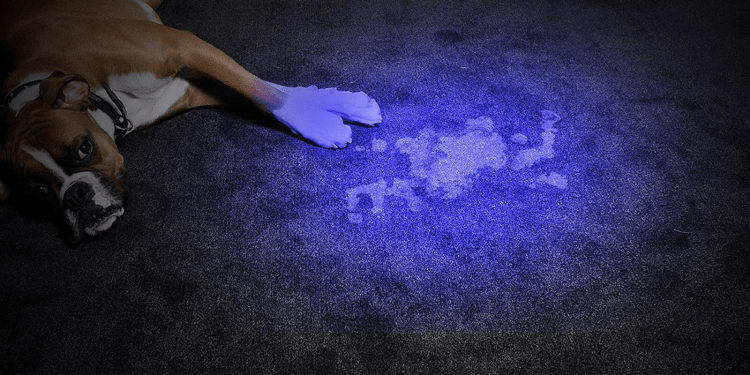 Be ready as this UV flashlight reveals stains you didn’t perceive for a long time in your home. From pet stains, leaks, bed bugs, to other pests, all unnecessary dirt in your home will be detected. As you clean your home, you will surely become meticulous! This UV flashlight is not only for home use. It works on other UV light uses as well! You may select upon the three colors available for this UV flashlight: black, silver, or purple. You have the freedom to choose according to your style or just to differentiate this UV flashlight from your other flashlight. I tried using UV glasses for safety. But I’m surprised with the difference if I will not use UV glasses. It greatly reduced my ability to perceive stains and other fluoresces. It is better to not use UV glasses at all. “Powerful UV Flashlight lets homeowners live safe, clean and odor-free!” This quote marked by KMD Homes summarizes their total dedication towards this UV flashlight. With only 6 AA batteries, you will enjoy using this product! This product lives to its name! It’s time to hunt those scorpions before they harm you! Escolite’s enhanced technology allows higher intensity on their UV flashlight. It is perfectly usable and efficient for scorpion hunting, though it works for other purposes as well. You can take this UV flashlight anywhere due to its water resistant and shock resistant metal casing. Again, it is not only great for scorpion hunting, but you can literally take it anywhere you wanted to. If you want to fluoresce something under water, then it’s totally fine. What’s really impressive about this UV flashlight is about the battery life. With only 3 AA batteries, the 51 pcs of LED will shine up to 20 hours of continuous usage. On some instances, I receive a UV Scorpion Flashlight that won’t work at all. Maybe a manufacturing defect, but the spring between the battery and the LED are not properly connected. With a little workaround, I managed to bring this UV flashlight to life. It works as promised though you need to spend some time. Most UV flashlights are designed with 100 pcs of LED or just a few LED bulbs. Escolite designed this flashlight with 51 LED bulbs to combine beam radius and battery life efficiently. Arf Pets always aim to give comfort to pets and joy to pet owners as well. “We keep them happy” has been their tagline for years. Since they manufactured UV flashlights, expect a design and usability optimization for home use especially on pet stuff and nearby items. 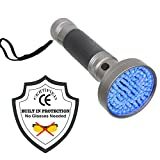 If you want to have a house free from pet stains, or even your pet stuffs free from stains insects, this UV flashlight will surely satisfy your need. 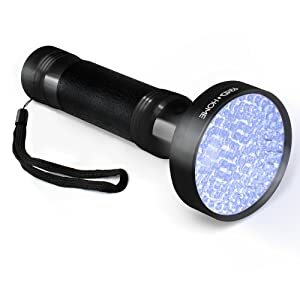 Aside from pet stain detection, this UV flashlight is reliable for security, for hunting, and for fun. 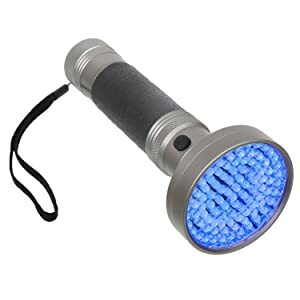 As it is designed with 100 LED bulbs, this UV flashlight powers up through 6 AA batteries. Don’t worry about energy-efficiency. You will still receive a decent battery life for this one. On rare occasions, I experience overheating. I’m reaching a time when I need to let it cool down. Cooling it down is preferable than literally getting my hands burned. Heat emission is surely normal, but overheating I guess is a design flaw. What’s amazing about this one is its premium aluminum construction. It is lightweight, durable, and sleek. Arf Pets even suggests using this UV flashlight when you play fetch with your pets. Surely, pet bonding has been maximized! While all UV flashlights do the same job, here’s a guide for you to know the slight variation among the UV flashlight competition. Some users prefer small radius of illumination just for stationary use, though most people prefer bigger radius. You may want to spot easily from a distance especially on scorpion hunting, pest hunting, and stain spotting. The radius of illumination all boils down to the number of LED bulbs used in a flashlight. There are three common number of LED bulbs found in the market: 12, 51, and 100. With 12 LED bulbs, expect illumination just around your standing point. This is good for document security check, money authentication, and ID verification. With 51 LED bulbs, expect illumination father from your standing points. This accommodates the need of illumination on scorpion hunting, insect spotting, and other wide-range activities. With 100 LED bulbs, expect higher intensity of illumination. 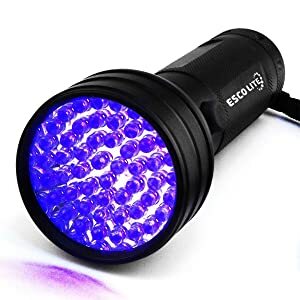 Even if the room light is still switched on, the UV flashlight will still immensely fluoresce nearby items. And when the room is dark, expect bigger illumination than 51 LED bulbs. Battery requirements and battery life depend on the number of LED bulbs used on a UV flashlight. If the manufacturer designs a UV flashlight holding a few battery, expect lower battery life on continuous usage. More battery requirement means more battery life, but the cost of the batteries may matter on your part. Reaching this section means you already understand the function and the core of UV lights. You will surely appreciate its essence when you open your mind more on what you can’t see. Believe it! There’s something you really can’t see that needs attention like stains, pests, and other unwanted stuff. With this review, you can finally choose the best UV flashlight which perfectly matches your preference.